Nutritional supplementation may play a preventive, therapeutic or even regenerative role when hearing loss occurs. Frequently doctors are remiss in making nutritional recommendations. It is now a common practice for physicians to address every disease as if it were a drug deficiency in the face of published reports showing nutritional imbalances are at the root of most chronic diseases. For example, confronted with a case of sudden unexplained loss of hearing, physicians impulsively inject steroids that have been shown to work no better than an inactive placebo. [Archives Otolaryngology Head & Neck Surgery June 2007] Yet there are valid nutritional approaches to emergent cases of hearing loss, as explained below. However, there are other issues outside of aging that increase the risk for hearing loss, namely anemia, toxic drugs (such as mycin antibiotics, aspirin, acetaminophen, diuretics and chemotherapy), loud noise, excessive alcohol and diabetes. Then there is sudden idiopathic hearing loss – a severe decline in hearing of unexplained origin. Aside from some lame attempts to allay the symptoms of hearing loss, physicians have little to offer for the common form of this problem. A number of recently published studies point to nutritional factors that are involved in hearing loss. A study of 1823 adults age 45-60 in France over 13 years showed hearing levels were better among those individuals who consumed the most vitamin A, vitamin B12 from foods and red meat (women). [British Journal Nutrition June 2013] This suggests women required iron to maintain hearing. Vitamin B12 is required for the myelin sheath that surrounds nerves and it makes sense that it would be beneficial for a nerve disorder. The connection with vitamin A is a bit surprising and requires further investigation, as provided below. Take notice, all but one of the above dietary studies identified vitamin A as a preventive agent against hearing loss. The potential for dietary supplements to avert or treat hearing loss is very promising despite a paucity of studies. The most common genetic caused of hearing loss, a mutation in the Connexin26 gene, was ameliorated with the use of supplemental vitamin A, C, E and magnesium in a young child. [International Journal Pediatric Otorhinolaryngology March 2014] Dietary supplements can over-ride a progressive inherited disease! It appears modern medicine has overlooked the most obvious remedy for hearing loss – vitamin A. The body of scientific reports involving vitamin A and hearing loss can be confusing. A three-decades-old report stated that cochleas (spiral-shaped snail shell-like structure of the inner ear) of vitamin A-deficient rats examined under an electron microscope concluded that “vitamin A does not have an important function in the inner ear.” [Archives Otorhinolarygology 1982] This study may have served as a giant misdirection. By 1990 researchers fed two groups of guinea pigs a vitamin A-deficient and supplemented diet and reported that the vitamin A-fed group had greater sensitivity to sounds. [Journal Nutrition July 1990] The researchers puzzlingly concluded that vitamin A may increase the probability of noise-induced hearing loss without recognizing vitamin A must be regenerative in some manner. Then finally a breakthrough was reported in 1993 in none other than the prestigious journal SCIENCE. Hair cells are the nerve cells that reside within the spiral cochlea of the ear and respond to sound by converting vibrations into electrical signals that are sent to the brain. Hair cells are damaged in both acute toxic stress (drugs, loud noise) and in chronic slow-progressive age-related hearing loss. What we have learned so far is that vitamin A is involved in all forms of hearing loss, from the womb forward. This report calls attention to another important paper published over a half century ago involving hearing loss and vitamin A. The important role of vitamin A in prevention and restoration of hearing loss was reviewed way back in 1951 by M Joseph Lobel MD, a practicing physician in New York. Dr. Lobel’s work stood on the shoulders of those who had preceded him and his published paper recognized them. The idea that vitamin A resolved or prevented hearing loss had been circulating since the 1920s. However, Dr. Lobel wanders a bit in his enthusiasm for vitamin therapy and doesn’t stay focused on his own study involving vitamin A. He mentions the work of Dr. Charschak who reported in 1936 that the provision of vitamin B-rich dried yeast resulted in the disappearance of 12 of 15 cases of tinnitus. In that same year Dr. G Selfridge reported that vitamin B1 and B3 “most beneficial” in deafness. Other doctors report success with B vitamins and iron. Then Dr. Lobel returns to the topic of vitamin A and refers to other early inconsistent reports, some which showed that vitamin A-rich cod liver oil remedied some cases of tinnitus (ringing in the ears) without hearing improvement. Dr. Lobel also cites the work of Dr. W. Rosenfeld who used vitamin A-rich cod liver oil and calcium and reported markedly reduced or disappearance of tinnitus along with hearing improvement. The problem here was the ample amount of vitamin A or the small amount of vitamin D in cod liver oil responsible for such a beneficial effect? Dr. Lobel noted the strongest argument against the theory that vitamins are important in nerve deafness that is that deafness is not a symptom of frank vitamin deficiency. Scurvy (vitamin C deficiency), pellagra (niacin B3 deficiency, beriberi (B1 deficiency) are not associated with nerve deafness. But certainly vitamins A & D are! However, Dr. Lobel mixed positive reports about vitamin therapy involving B vitamins with his notations about vitamin A. So his enthusiasm for vitamin therapy becomes a bit muddy at this point. Dr. Lobel’s work was not to go unchallenged. Miles Atkinson MD, an obvious competitor of Dr. Lobel’s in New York City, wanted to determine whether Dr. Lobel’s results were produced by B vitamins from dried yeast or the injectable vitamin A, since both were used in some patients. But you can see by reading the above modern day reports that vitamin A still stands tall as a therapeutic agent for hearing loss of all forms. A strong piece of evidence of vitamin A’s ability to not only protect but regenerate or replace damage hair cells in the ear comes from modern work with stem cells, which are internally produced. Stem cells are unspecialized cells that can be converted to specialized cells such as muscle or nerve cells. It becomes very clear now that vitamin A not only works to inhibit ear infection but also to provoke endogenously produced stem cells to differentiate into hair cells in the ear. The problem in today’s commercialized research environment, any natural remedies like vitamin A therapy will be cast aside until modern medicine can figure out to how produce more financially rewarding cures. Conventional medicine has had over eight decades to capitalize on the discovery vitamin A restores hearing. Over that time more Americans now live into their eighth and ninth decades of life and suffer from age-related tinnitus and hearing loss. In summary, there is lab dish, animal and human (dietary and supplemental) evidence that vitamin A prevents, treats and can even reverse hearing loss. While clinicians may demand more controlled studies, there is no reason not to recommend vitamin A to anyone who has experienced hearing decline of any origin. A problem arises in this era of vitamin D awakening. Vitamins A and D compete for absorption in the liver. This author experienced two eye infections, his first ever, while taking daily vitamin D supplements. Apparently supplemental vitamin D was crowding out vitamin A and the mucin layer of my tear film was lacking. Supplemental vitamins A & D remedied the problem. This author’s suggestion is that individuals with hearing problems take a 50,000-unit dose of vitamin D once a week and take vitamin A, at least 10,000 IU daily. Another problem is that modern medicine has frightened consumers away from vitamin A pills. Ask a doctor and he will quickly tell you supplemental vitamin A is potentially toxic. Acute vitamin A liver toxicity may occur after ingestion of 500,000 international units of vitamin A (100 times more than the Recommended Daily Allowance) by adults. Reported incidences of vitamin A toxicity are rare and have averaged fewer than 10 cases per year from 1976 to 1987. [American Journal Clinical Nutrition Feb 1989] Vitamin A liver toxicity generally occurs among alcoholics who already have liver disease. Either cod liver oil that is rich in vitamin A or vitamin A acetate can be taken. Individuals with tinnitus (ringing in the ears) and hearing loss should probably initiate a trial regimen of vitamin A supplementation for six weeks to assess if there is any improvement. Combined use with low-dose resveratrol (50-100 mg) and once-weekly vitamin D may be advisable to encourage stem cell renewal of hair cells. 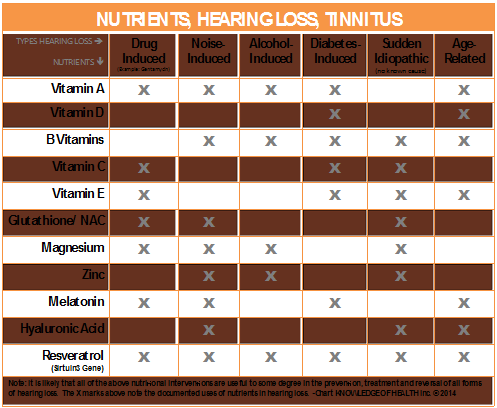 There is other evidence that nutrients can stave off age-related hearing loss. Calorie restricted diets extend the lifespan and healthspan of laboratory mice and slow the progression of hearing loss. The genetic mechanism behind limited calorie diets slowing hearing loss has been identified as activation of the Sirtuin3 survival gene, which operates in the mitochondria (atomic power plants) within living cells. [Experimental Gerontology Oct 2013] Sirtuin3 gene protein increases glutathione, a naturally produced antioxidant, within mitochondria. Individuals with osteoarthritis (wear and tear arthritis) are far more likely to experience tinnitus. [Clinical Otolaryngology Apr 10, 2014] Oral hyaluronic acid may be helpful.